Mandalay Bay is one of my favorites places on the Strip. I love the theme of the place. I included a portion of the exterior of the property in my book Free Things to Do on the Strip: a self-guided tour. The Shark Reef, of course, is not a free attraction, but it has the same creative look and feel to it. Although the Shark Reef is the main attraction, there is a companion exhibit called The Polar Exhibit. This is included in the price of admission. Inside the Polar Exhibit is a type of ride where you visit both the north and south poles and experience them in 270 degrees television screens. But I am getting ahead of myself. 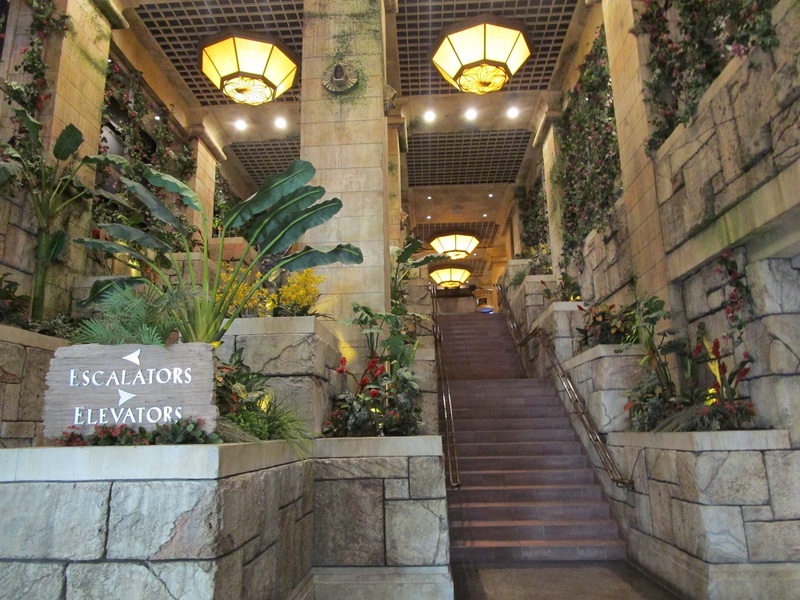 To get to the exhibit, you first need to go up an escalator or elevator. Take your pick. When I first came here, I was surprised to find animals on display here. They have a crocodile and a Komodo Dragon. 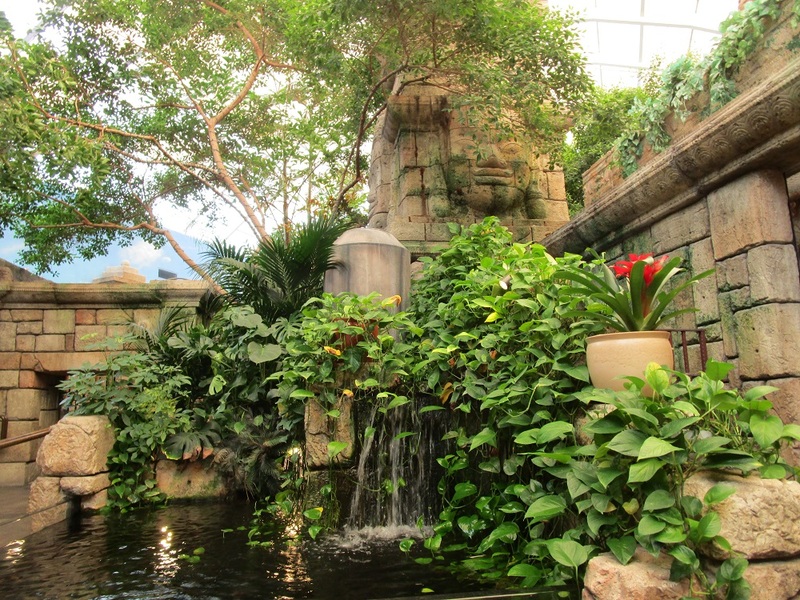 Both fit well with the South East Asian theme of the exterior of the property and blend in with the jungle design that surround the animal exhibits here. After this there are a few smaller tanks with animals such as star fish and an octopus. 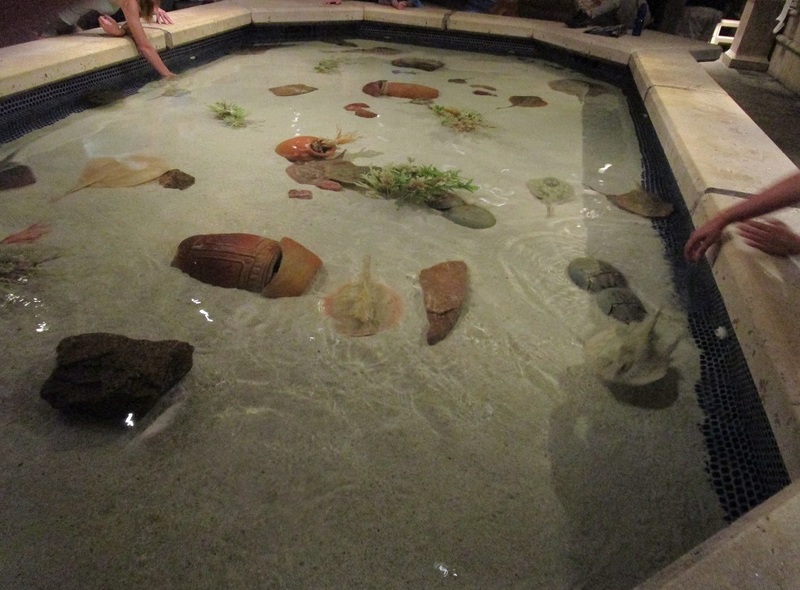 There is a touching pool where you can lean over and touch fish, mostly rays. Obviously not a species that can hurt you. Kids seem to love this, but I saw a few adults, including my photographer, that enjoyed it as well. The design of the viewing area for the sharks is creative. They make it seem like you are inside of an old sunken ship like the ones from English or Spanish fleet from the 15th century, or perhaps a pirate ship, if you will. 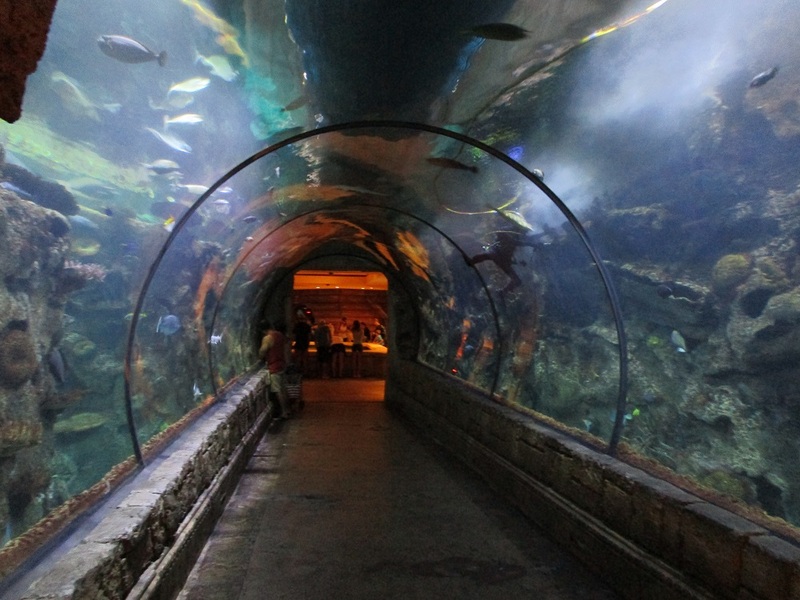 There is also a tunnel in which you can see the sharks on both sides and swimming above you as well. They try to give you the feeling that you are resting on the bottom of the ocean floor. Although there are smaller tanks, the main tank that holds the sharks is over 1,300,000 gallons. This ranks high among the largest tanks found in the country. Some of the sharks seem to swim away into the darkness as if you really are in the ocean. There are a variety of sharks in the tank, and like most aquariums, they have pictures and descriptions along the walls and in front of the glass, so you will know what you’re looking at. Don’t expect anything spectacular here. There are no tiger sharks, bull sharks or makos, and certainly no great whites, but there are some large sharks. Some of them can be dangerous in the wild. The sand tiger shark is definitely menacing. You can get a full list of sharks and other animals here. Once you’re through visiting the Shark Reef, you should go to the Polar Exhibit. When you first buy your ticket for the Shark Reef, there are actually three tickets. One is for the Shark Reef, and the other two are for the Polar Exhibit and the ride called the Sea Explorer. The Polar Exhibit is an interactive exhibit that allows you to learn about the polar ecosystem with various electronic displays that allow you to interact, mostly by touching buttons and screens. The ride is called the Sea Explorer, and they allow a certain number of people in a room at a time. You stand on a platform that is connected to hydraulics. The platform then moves side to side, forward and backward. And this way you have a panoramic, 270 degree view of the surrounding. You’re suppose to think you’re in a submarine, and it does give you the feeling of being at sea when the submarine breaks the surface of the ocean. However, at times it can also feel jerky. I was standing by the railing of one side of the platform, so I was able to hang on. I have a problem with my balance to begin with, so if you have a similar issue, stand toward the railing, just in case. The ride was interesting, and I’m glad I went. I had to wait a few minutes until the ride was over for the people already inside the room, but the wait wasn’t too long. I was confused on the ride. You’re suppose to be inside a submarine, and somehow, you go from the north pole to south pole in just a few seconds. Apparently it was an underwater worm hole. When I saw penguins, I realized I had traveled from one pole to the other. I didn’t understand how that was possible in a submarine. Perhaps I took the experience too seriously.